Things have gone very badly pear-shaped for the Louvre Abu Dhabi Salvator Mundi. It took thirteen years to discover from whom and where the now much-restored painting had been bought in 2005. And it has now taken a full year for admission to emerge that the most expensive painting in the world dare not show its face; that this painting has been in hiding since sold at Christie’s, New York, on 15 November 2017 for $450 million. Further, key supporters of the picture are now falling out and moves may be afoot to condemn the restoration in order to protect the controversial Leonardo ascription. Above, Fig. 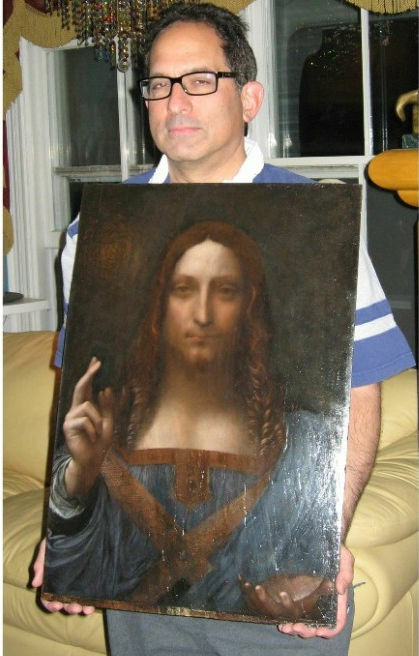 1: the Salvator Mundi in 2008 when part-restored and about to be taken by one of the dealer-owners, Robert Simon (featured) to the National Gallery, London, for a confidential viewing by a select group of Leonardo experts. Above, Fig. 2: The Salvator Mundi, as it appeared when sold at Christie’s, New York, on 15 November 2017. Kemp may have had in mind the forthcoming 2019 Louvre exhibition to mark the 500th anniversary of the artist’s death but no one at the Paris Louvre will now confirm that the Abu Dhabi Louvre Salvator Mundi will be included. Is Paris about to spurn Abu Dhabi’s $450 million acquisition? Failure to include the work next year would risk humiliating the United Arab Emirates (who paid something like Euros 400 million for the right to exploit the Louvre title – roughly the cost of one big yacht) when French foreign policy dictates every deployment of soft cultural power to gain influence in that traditionally Anglophile quarter. Above, Fig. 3: Left, the Salvator Mundi as restored in 2008; right, a National Gallery painting attributed to Bernardino Luini. The claim never to have over-painted is universally asserted by restorers. While no code of restoration “ethics” sanctions painting over surviving original paint, the profession’s philosophical pieties constantly conflict with observable visual facts. We have previously shown that if you juxtapose halves of the two Salvator Mundi faces, as seen in 2011-12 at the National Gallery and at Christie’s in November 2017 (see Fig. 7 below), there is a mismatch: scarcely any passages of painting run across the halves. As the photo-records below testify, this version of the many Leonardesque Salvator Mundis has enjoyed two distinct identities in seven years and three in ten years. We discuss the unreported covert transition from the second to the third below. That last image (here at Figs. 5-10) has been published with a drum roll by Jones in the Guardian as if a proof of Leonardo’s hand when it had been published by Modestini in 2014 (albeit small and in printed not online form). Although a considerable improvement on earlier versions (as published by us) it does not tell a different story. On the Jones premise, will Modestini now produce equally high-resolution photographs taken before and after each of her various interventions (2005-08; 2008-11; post 2012 and pre-2017)? If she insists that all photographs are inherently untrustworthy and easily falsifiable, will she explain why so many photographs of paintings are made and published and why they never carry visual health warnings? Are all photographs previously made for restorers’ own restoration reports now deemed to be unreliable testimony? Above, Fig. 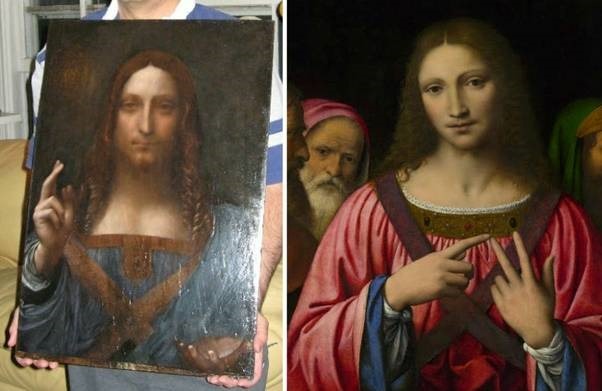 4: Left, the photograph of the Salvator Mundi painting when in the Cook collection and judged to be a work of Bernardino Luini; right, the former Kuntz family and then Basil Clovis Hendry Sr. estate painting, as in the 2005 St. Charles Gallery catalogue. Above, Fig. 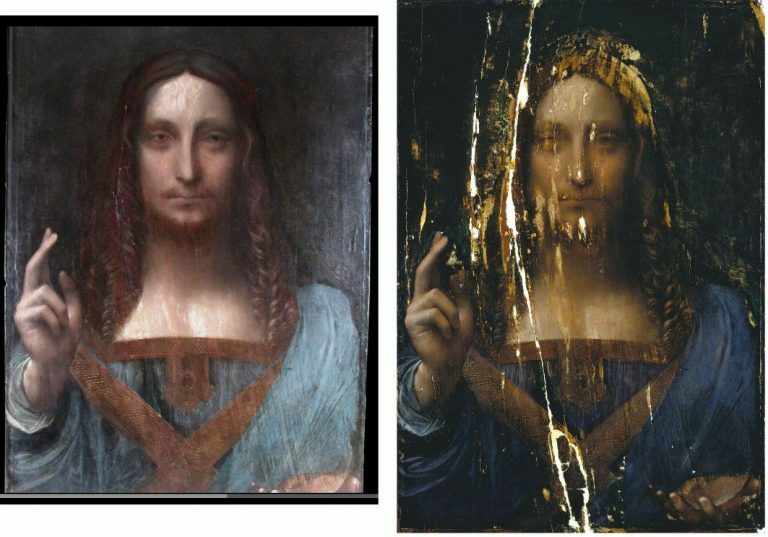 5: Left, a screen grab of the Salvator Mundi as when taken, still sticky from a previous restoration in 2005 to Dianne Modestini’s New York studio; right as in 2007 in the newly released high-resolution photograph following cleaning and repairs to the panel but before any retouching, infilling or repainting. Will Modestini publish a photograph of the painting as presented to her in 2005? Above, Fig. 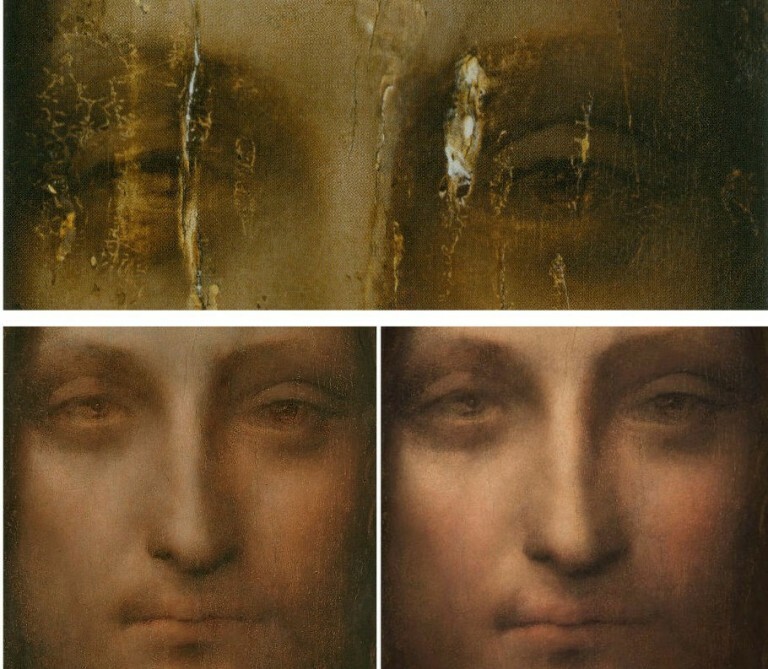 6: Left, the Salvator Mundi as in 2006/7 (in high-resolution) after cleaning; right, as in 2011 as exhibited as a Leonardo at the National Gallery, London, and after much repainting – some of which was distressed and contained false, painted lines of cracking in emulation of aged paint cracks. Above, Fig. 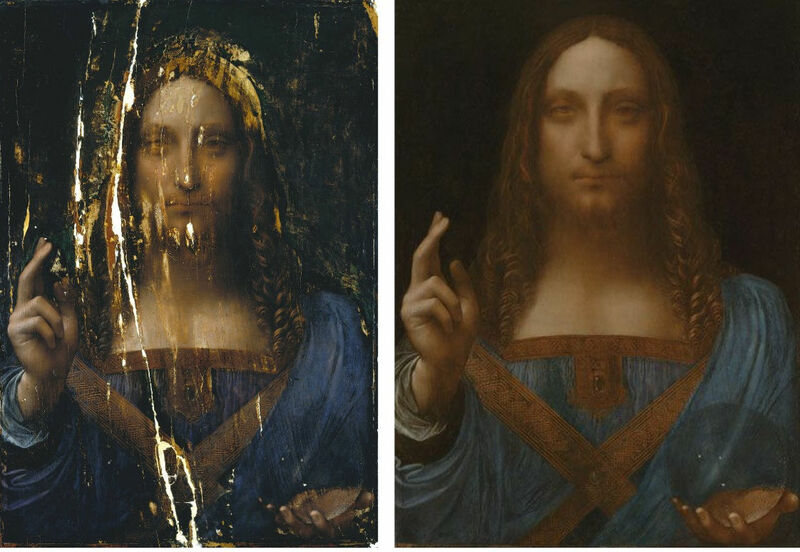 7: Left, the Salvator Mundi as in 2006/7 (in high-resolution) after cleaning; right, as in 2017 when sold at Christie’s, New York, after further covert restoration. Above, Fig. 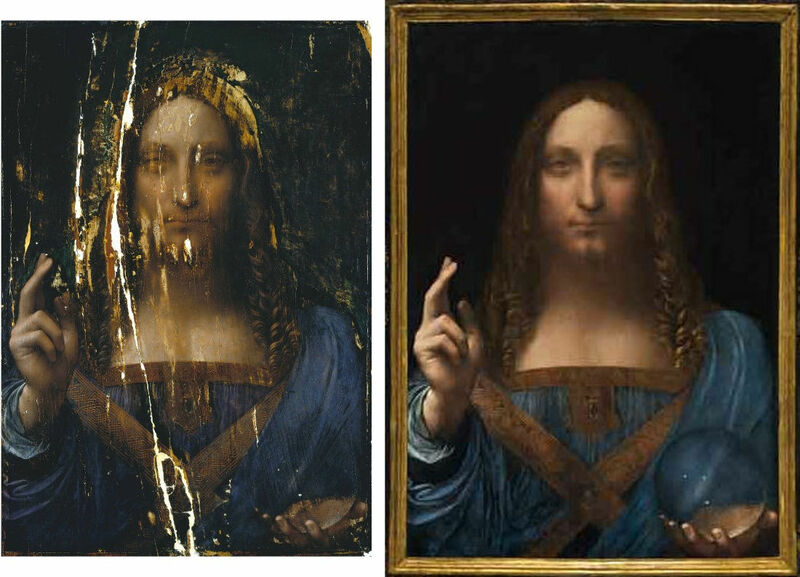 8: Left, the head of the Salvator Mundi as in 2006/7 (in high-resolution) after cleaning; right, the head in a split screen compilation showing the appearance in 2011 on the left and in 2017 on the right. Above, Fig. 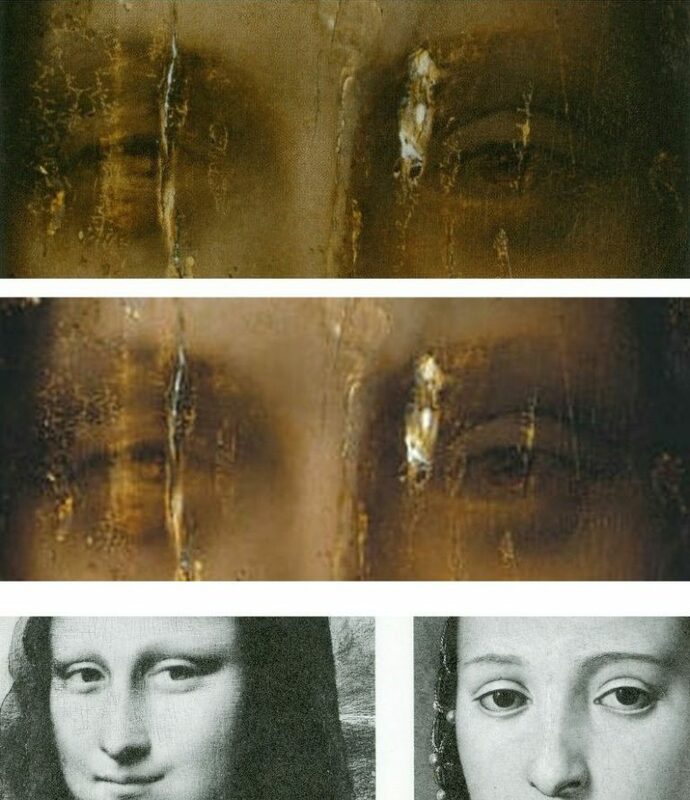 9: Top, a detail of the Salvator Mundi’s eyes as in 2006/7 after cleaning and before repainting (and as published by Modestini in 2014); above, left, the face, in 2011, and, right, as in 2017. Above, Fig. 10: Top, a detail of the new high resolution photograph, as published online by the Guardian; centre, the corresponding detail as published by Modestini in 2014, the previously best detail of the cleaned and not-yet repainted eyes; above, eyes by Leonardo and Bronzino. The lower images are surely instructive here? 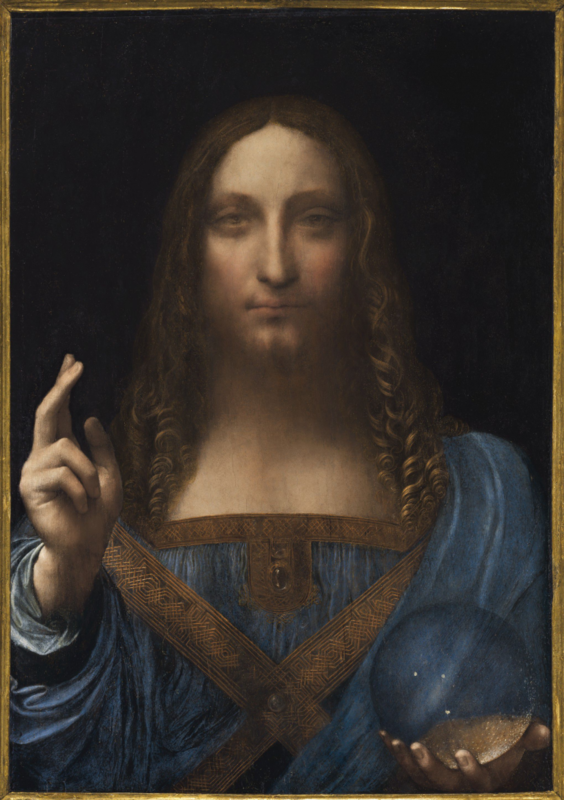 The Salvator Mundi was hyped by Christie’s, New York, as an iconic thing – a “Male Mona Lisa”. Martin Kemp holds that it was painted by Leonardo after he had painted the Mona Lisa and that he had deliberately put the face “out of focus” so as create spiritual mysteriousness on the one hand and an illusion of spatial depth and recession in an emphatically flat (and heavily cropped composition) on the other. If we look at these images art critically we can safely make a number of factual, verifiable observations – and these are not “subjective”. First, although the high-resolution photograph is superior as a photograph to the lower resolution image, as published in a book, it does not tell a materially or artistically different story – in both we can see the extent of losses and the fact the treatment of the eyes is neither identical nor consistent. In particular we can see that the treatment of the heavy flattening upper eye lid on the right is sharply (and badly) drawn, while that on the left is softer and almost undoubtedly abraded. Modestini somehow equalized the effect of the eyes while leaving the implausible severity of drawing found in the lid of the eye on the right. Neither eye in this painting is remotely comparable with the Mona Lisa’s eyes where softness of effect has been achieved without loss of sculptural lucidity or anatomical veracity. These differences are ones of quality more than of style. The creases formed by the meeting of the soft flesh of the upper lids with the more taught flesh of the brow is more sharply drawn in the Bronzino but it is also drawn with greatly more acuity and finesse than the eye on the right of the Salvator Mundi. Much of the great benefit photography brings to art historical scholarship lies in the ease with which detailed style comparisons can be made. In an age of high quality and electronically transmissible photography, if you are going to claim Leonardo you really should take the opportunity to demonstrate Leonardo. Above, Fig. 11: A succession showing the picture and two details, with the first each time, as in 2011 and, second, as in 2017. The question raised by Modestini is the extent to which the differences shown above are products of Christie’s own “more vivid, sharper, snazzier” images of the 2017 state or of her own repainting. 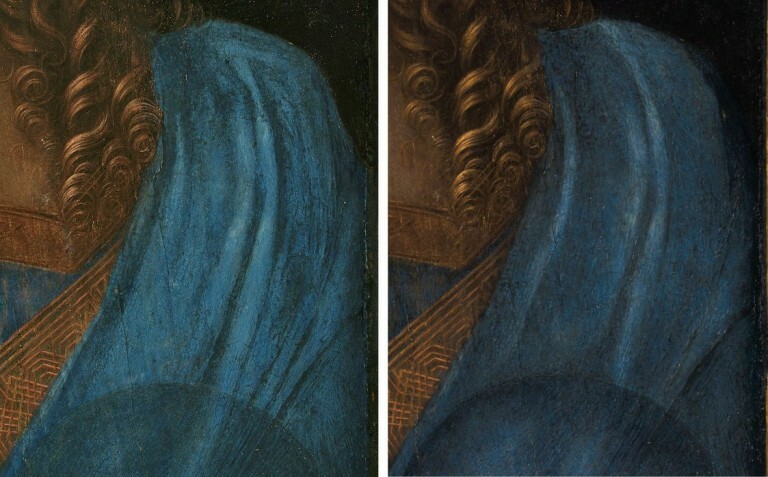 It can safely be said that repainting must substantially account for the differences because changes have been made to the design of forms as can be seen here in the comparison of the details of the shoulder drapery. It would be helpful if all parties to the post 2005 “conservation treatments” would publish full accounts of them accompanied by the best available photo-records. Note: these are only the changes that were made between 2007 and 2011. There has been no account of the subsequent restorations. If we look at the top of the split-image of the face at Fig. 8, we can see that the hair immediately to the right of the parting had become much darker by 2017 while the flesh tones in the forehead and nose had become lighter. No account of these changes has been published. Without mention of Hollar’s testimony, a pragmatic explanation is offered for an intellectual flip: “the optics” were put to the test and it was found by due and diligent research that they “would not work”. By “would not work” Kemp suggests that his efforts with a real crystal orb to replicate the kind of refraction he had earlier claimed to recognise in the double image of the hand holding the orb had been unsuccessful. But might there not have been another reason for dropping the earlier refracted hand thesis? 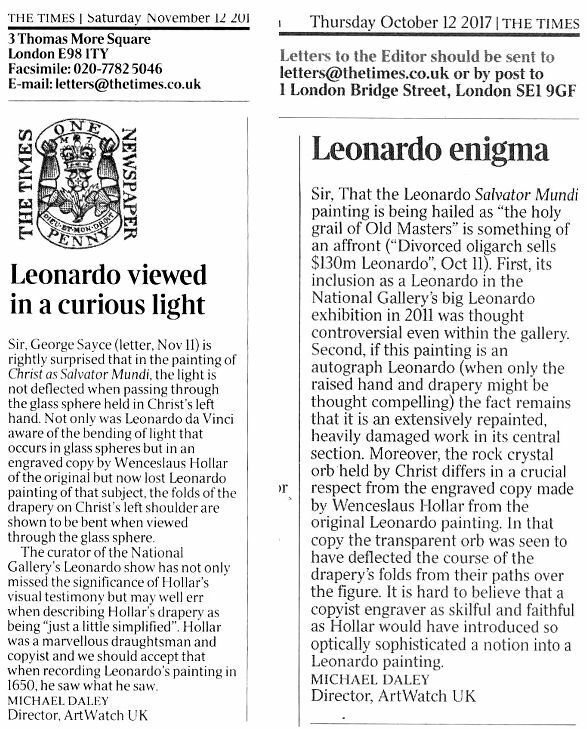 As mentioned, Kemp’s Nature article appeared on the day the National Gallery’s Leonardo exhibition opened, 9 November 2011. On 11 November, a correspondent asked in the Times why no optical deflections were evident in Christ’s globe. The next day the Time’s carried our letter (Fig. 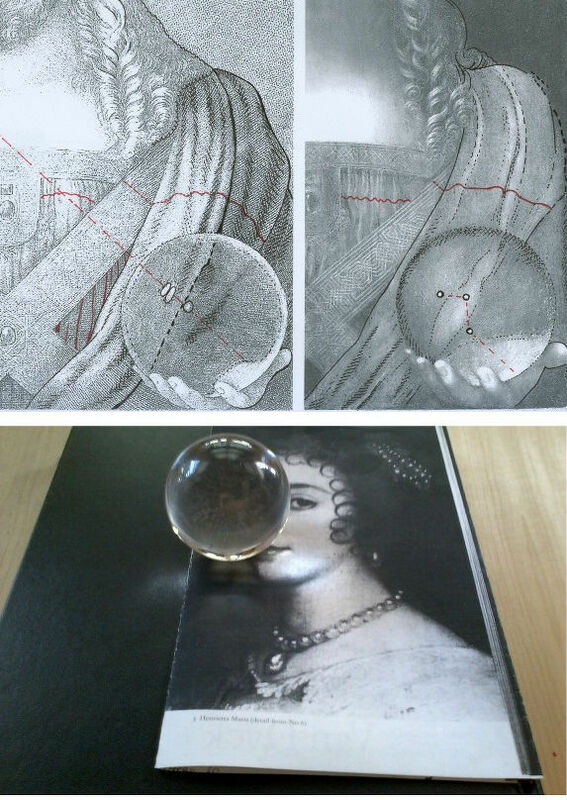 12, below) pointing out that in an etched copy by Wenceslaus Hollar of the original but now lost Leonardo Salvator Mundi the drapery seen through the orb had been deflected. This problematic visual mismatch must have compounded political problems: the gallery’s decision to exhibit a proposed Leonardo of little provenance and no art historical or technical literature and that was in the hands of a group of dealers (and therefore, inevitably, on the market) was institutionally questionable and certainly controversial. It became the more so when at least four Leonardo scholars challenged the attribution of the painting. Kemp, at that point, was hoist on his own scientific petard. Where the gallery had claimed in its catalogue entry on the painting that “There could be no doubt that this is the picture that was copied by Hollar”, it was now evident that it could not have been – and without that claimed connection, the picture’s supposed provenance collapsed from one in which it had passed down to us first through the French royal family in Leonardo’s day and then to the English royal family in the 17th century… to one that only began in England in 1900 when it had emerged from no acknowledged source, with no history and only as a painting given to Luini. How would the gallery respond to this very public correspondence and challenge? How would Professor Kemp respond? The National Gallery made no reply to the letters in the Times perhaps judging silence to be a better defence than open art critical engagement. Professor Kemp, too, was silent in the public prints, so far as we know. Above, Fig. 12: Two ArtWatch UK letters to the Times. Perhaps not, but then why not introduce into the discussion the visual/artistic fact that Hollar had copied a deflection of curved forms of drapery when seen through a curved transparent body symbolising the cosmos? Would a copyist have invented an optical distortion in a painting he believed to be an autograph Leonardo? In journalism, as supposedly in science, facts are held sacred and opinions somewhat less so. Are awkward facts expendable in science-rich art history? Properly considered, Hollar’s testimony is an important event in the history of scientific engagement in art – just as it had been in Holbein’s use of an optic to correct the anamorphosis in the foreground skull of The Ambassadors in the National Gallery – as a scholar had proposed in the 1970s and I had corroborated in the 1990s. How long will such testimony remain institutionally and professionally un-personned? Above, Fig. 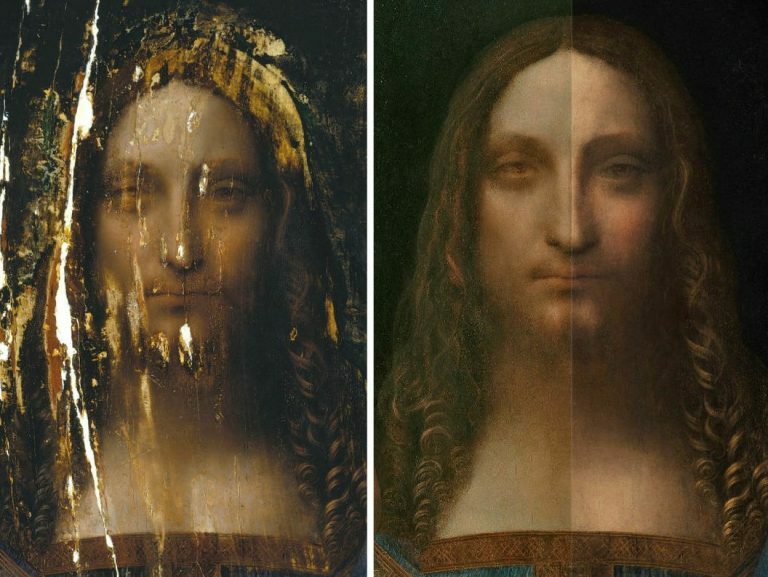 13: Left, a section of drapery in the Louvre Abu Dhabi Salvator Mundi when exhibited at the National Gallery in 2011-12; right the Modestini-changed section of drapery when sold at Christie’s New York in 2017. Above, Fig. 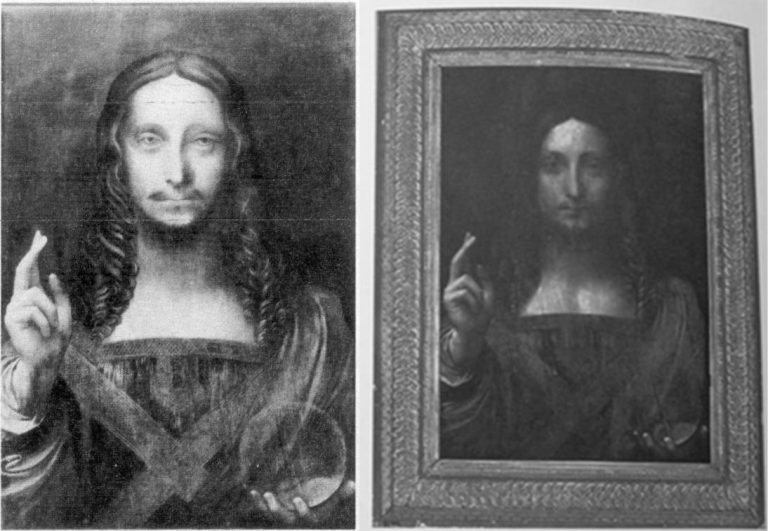 14: Left, Hollar’s 1650 engraved copy of a Salvator Mundi attributed to Leonardo that shows deflected folds of drapery within the transparent orb; right, the Abu Dhabi Louvre Salvator Mundi as seen at the National Gallery at the time of the above correspondence in the Times. The double edge of the hand holding the orb had been left in place on the then Kempian view that it demonstrated Leonardo’s sophisticated optical knowledge. Had that double image been judged a pentimento it would, like that encountered on the thumb of the raised true right hand, likely have been painted out by Modestini on the advice of the National Gallery curator, Luke Syson. Above, Fig. 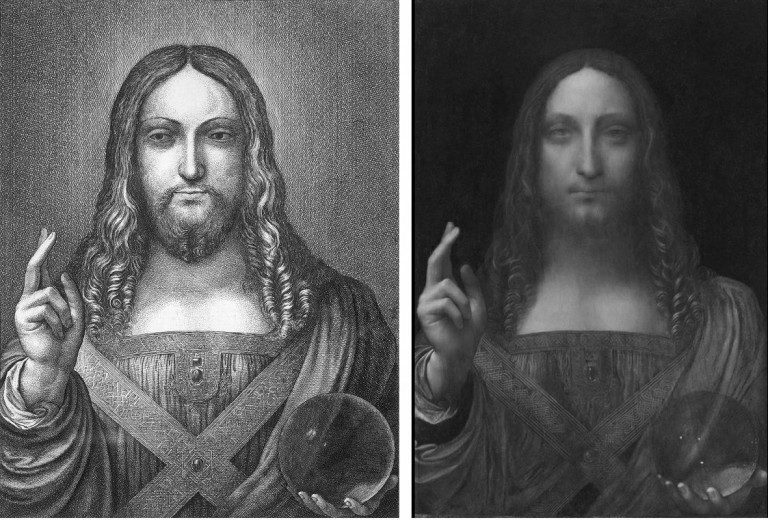 15: Changes made to the Salvator Mundi’s orb and adjacent draperies as seen respectively (from left to right) in 2008, 2011 and 2017. Above, Fig. 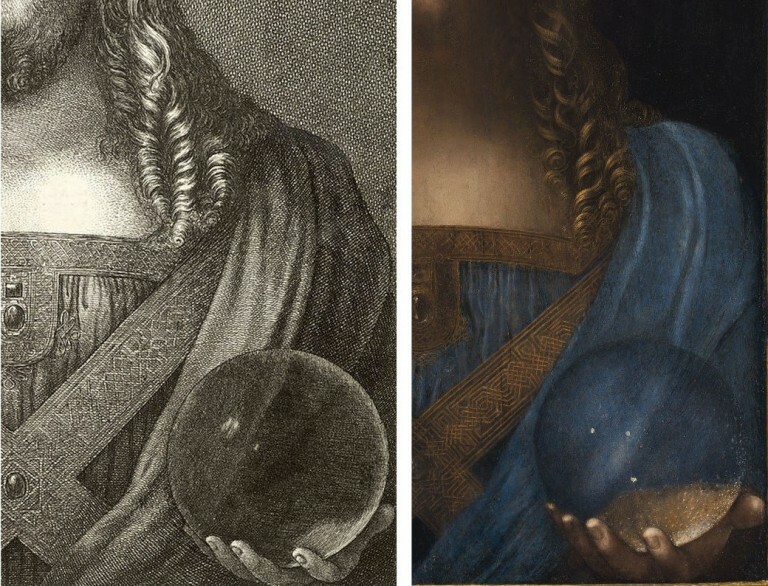 16: Left, the 1650 Wenceslaus Hollar etched copy of a Salvator Mundi painting; right, the Abu Dhabi Louvre Salvator Mundi, as seen in 2017 with changed draperies. In the Hollar we can how the central, highlighted fold of drapery is deflected from its convex path into a concave formation as it runs through the centre of the orb and between the aligned double and single light reflections. 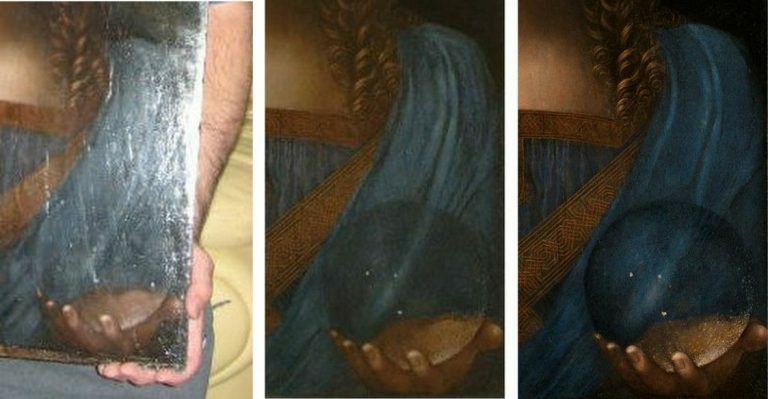 We can see how the heel of the copied hand was smaller and deflected towards the circumference of the orb; right, in the Louvre Abu Dhabi painting (third state) we can see how Modestini had darkened the circumference of the orb and brightened the interior. It is simply inconceivable that as skilled a copyist as Hollar could have drawn his orb from this, now Louvre Abu Dhabi painting. Above, Fig. 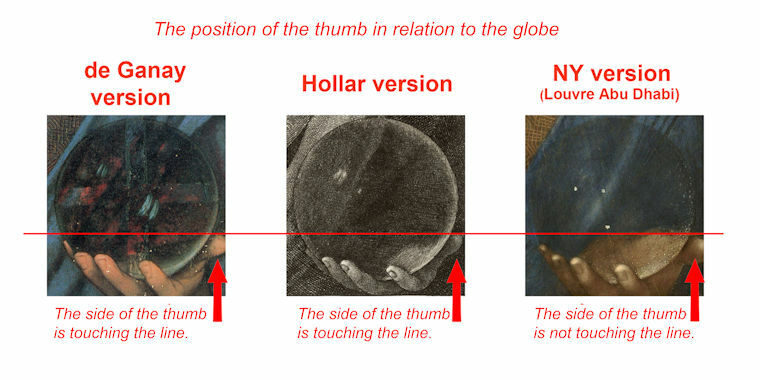 17: Top, two diagrams showing differences of design and modeling between the 1650 Hollar copy, left, and, right, the Louvre Abu Dhabi Salvator Mundi as sold in 2017. 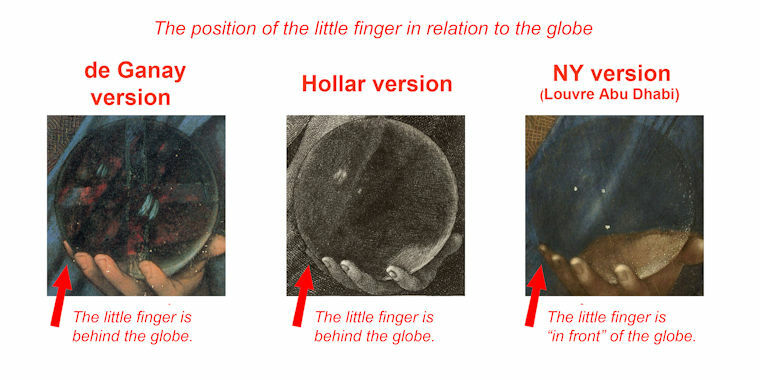 The three reflected highlights in the Hollar orb are aligned in accord with the picture’s top-left down light source which is evident throughout the painting that Hollar copied. The three unaligned white spots in the Louvre Abu Dhabi picture were attributed by Modestini to “reflections on the sphere to an outside source, but since many of the original glazes have perished, even when toned down, they float with context.” Above, a glass sphere owned by the author that shows the pushing of light towards the circumference, as copied by Hollar. Above, Fig. 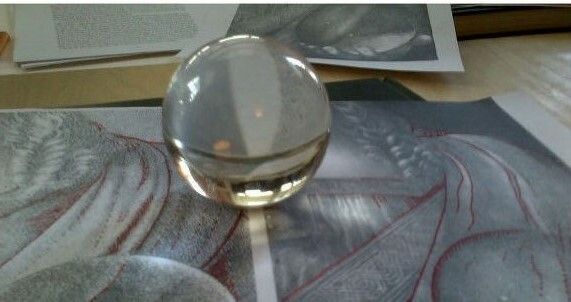 18: The author’s glass sphere. Where Martin Kemp failed to locate a double refraction in a small rock crystal orb, we demonstrated, as above, that when parallel straight lines (as here in the white gap between two photocopy diagrams) are viewed through a glass orb they are deflected into curves. 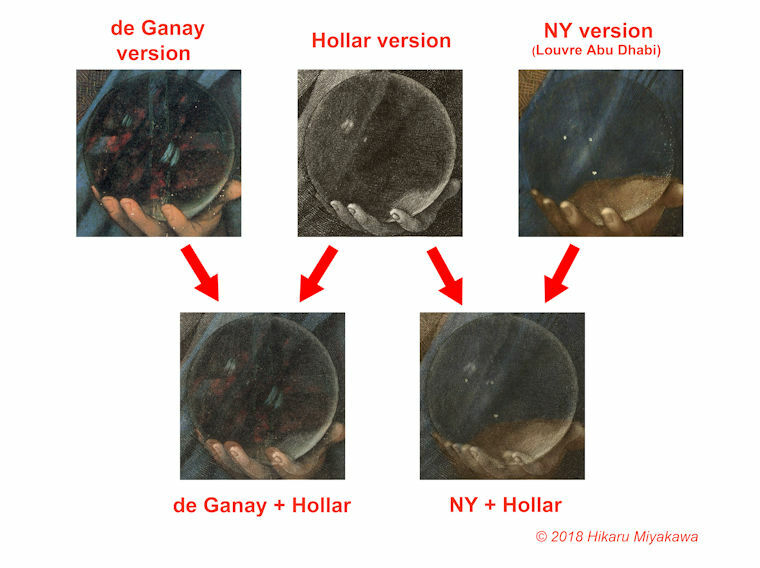 In our previous post the painter Hikaru Hirata-Miyakawa showed through the three graphics below that in addition to all the above problems with the suggestion that the Hollar engraved copy had been made from the Louvre Abu Dhabi picture, the globe copied by Hollar bears a much closer relationship to the globe found in another Leonardesque painting, the so-called de Ganay Salvator Mundi, than to the globe seen in the Louvre Abu Dhabi Salvator Mundi.